Creative idea book for Girl's dressing table designs and ideas for kid's room, Kid's dressing table types, prices, materials and organization tips according to the girl age. 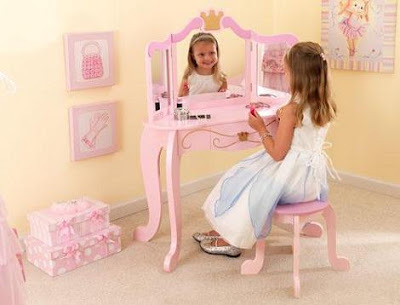 Kid's dressing table for a girl is needed in the same way as for a lady. The girl who learns to decorate herself from childhood will be A beautiful woman. Comprehension of the subtleties can be moved up to adulthood, but it is necessary to vaccinate from the very childhood and even get used to using shadows, lipstick, and powder. 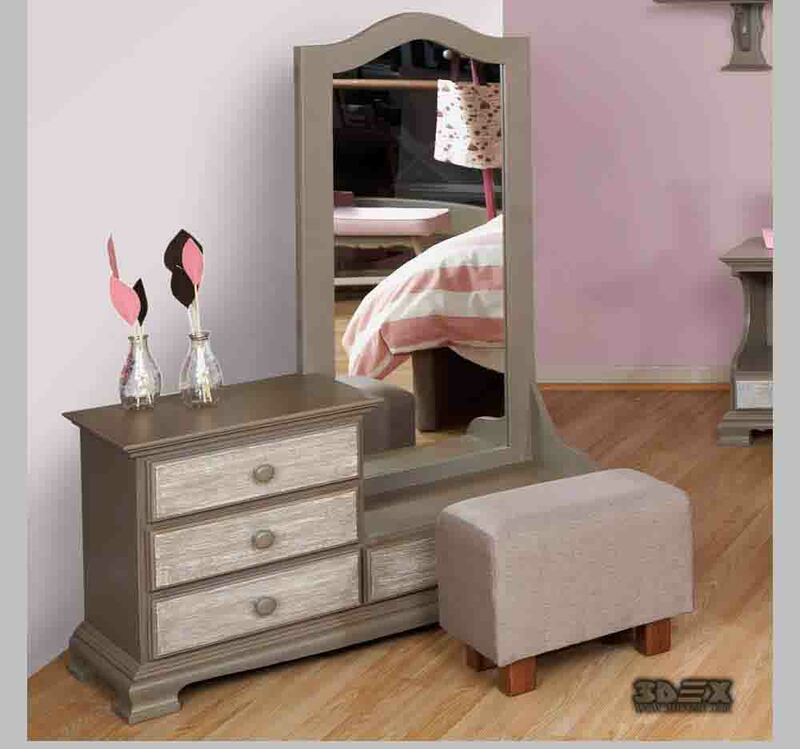 How to pick up a girl's dressing table? We will tell you. 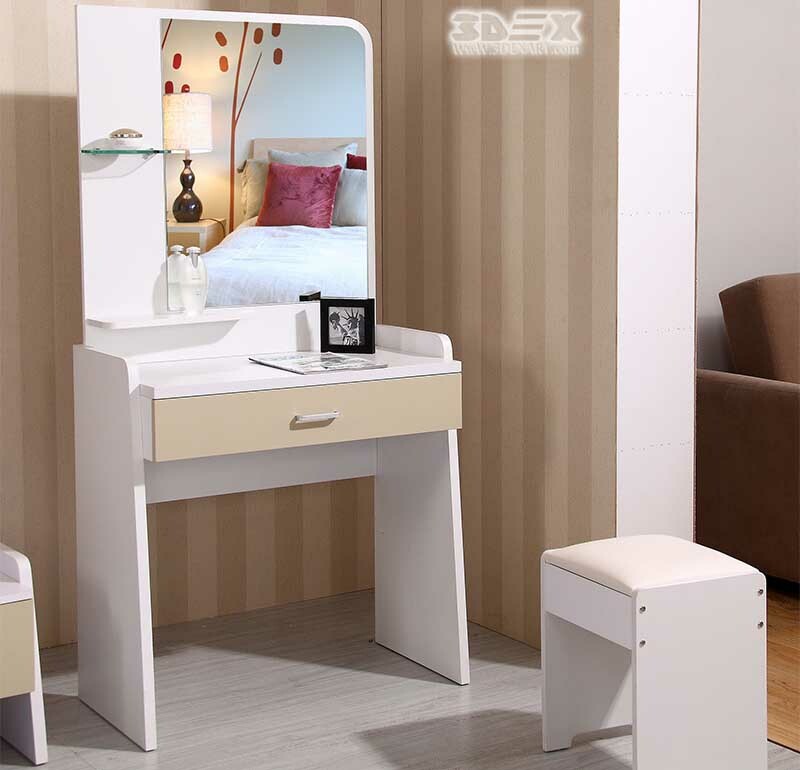 You also may like to see: Latest Dressing table designs for bedroom 2019 catalog. Why should girls have a Kid's dressing table? One of the kid's favorite fun is playing as adults. Even very young princesses with great satisfaction imitate mothers, grandmothers, elder sisters, sincerely hoping that very soon they will be the same beauties. In this case, the girl's dressing table for a kid's bedroom will be a magnificent gift for her. This will be a corner of beauty, a place where she will create her imagination beauty, not only for dolls but for herself. 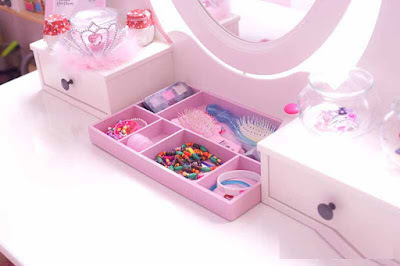 It will reliably store various bows, hair clips, first cosmetics and costume jewelry. 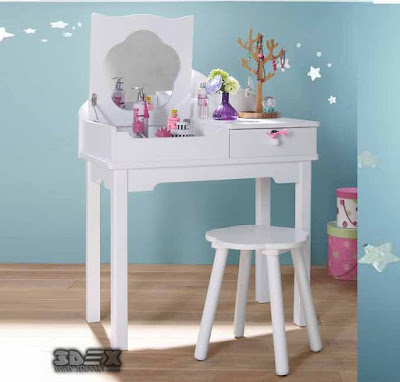 Kid's dressing table for girls can be decorated with classical neutral colors, taking into account her hobbies, which will attract her attention. 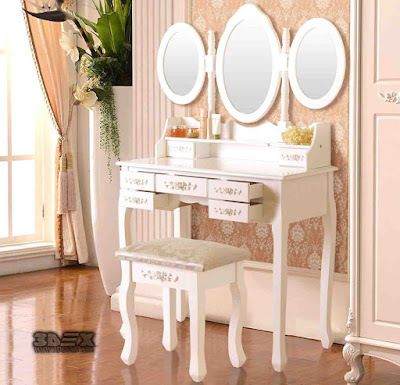 Tips on choosing a Girl's dressing table design. The difference between an adult table and a kid's one is that it is a subject of the role-playing game, which exhausts itself to about seven years. Almost all kid's games are an imitation of adult activities, and caring "beauty" in front of a mirror is the same game. The girls notice the behavior of women, imitate their mothers. Very often it pushes the girl to take mother's cosmetics, adornments, their shoes or clothes. Having a model of furniture with a set of her cosmetics is an excellent way to minimize the consequences of such "intrusions". 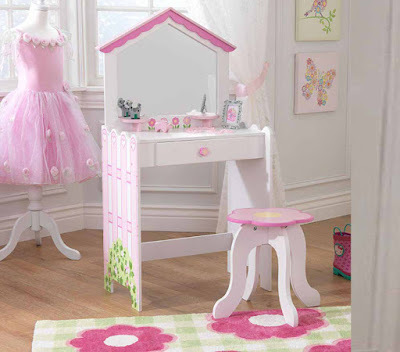 The Kid girls dressing table designs differ from the adult designs in that it does not serve as a color or stylistic accent: children's furniture in itself presupposes a simple but quite vivid design. Younger school girls are cooler to gaining their own beauty. 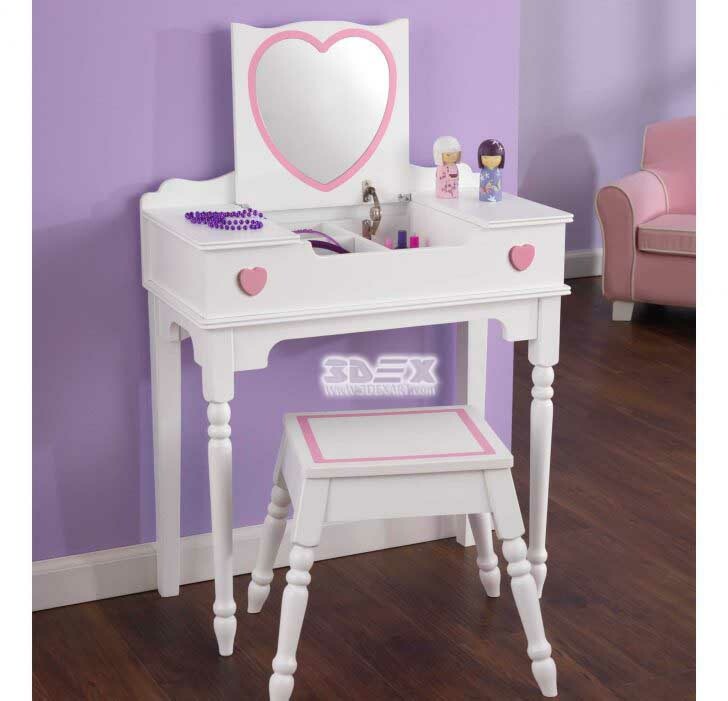 And by the age of 14 will need a dressing table for the bedroom and a functional and large volume. Preschool from 3 to 5 years is enough only a simple countertop, which has rounded edges without any drawers to get carried away easily, they did not hurt the little fingers. It is not the functional purpose of the object that is important here, but its design: the image of fluffy Kitty or Dasha the traveler will please the kid more than the most diverse storage systems. 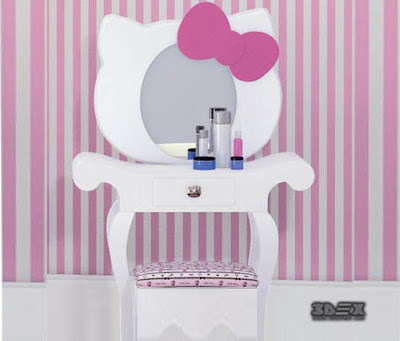 The photo shows a girl's dressing table design for a little girl with bears. Kid's Dressing table design with a mirror for a teenage girl can be equipped with pull-out and hanging elements that will allow you to comfortably place here the necessary items for beautifying and different pens, markers, favorite photos, beads for weaving or rubber and other treasures. In this case, the girl's dressing table design for kid's room should be as close as possible to the "adult" model, the curved legs, the non-standard countertop, the decor of the fittings made of sparkling rhinestones or large beads. The colors of the furniture should be chosen usually in line with the rest of the interior. Advice: Kids dressing table designs for girls should avoid specificity in the drawings, even if one can guess which teenage addictions at this stage of his life. They can easily get bored after two months. Therefore, preference should be given to multi-colored designs or neutral ornaments. A design with a mirror is a universal product for any age. To protect the smallest women from being old-fashioned, you should choose simple mirrors, where they are securely fixed to the tabletop. And for teens, the best option is to install a rotating one or a folding mirror on the table, which can be used as a chest of drawers or desk if necessary. A music table. In this type of girls dressing table design for kid's bedroom, a special player is built in, which allows you to listen to different melodies or even record the voice of your little girl. 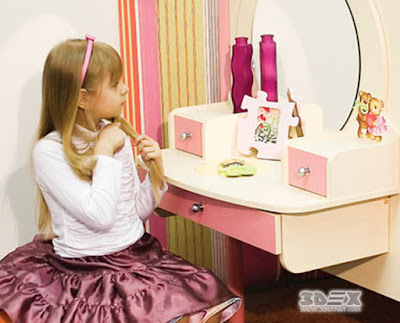 Directly on the table top displays the control panel, and the girl can simultaneously play in the beauty salon or prettify under funny songs for kids. But this model is interesting only for little girls. 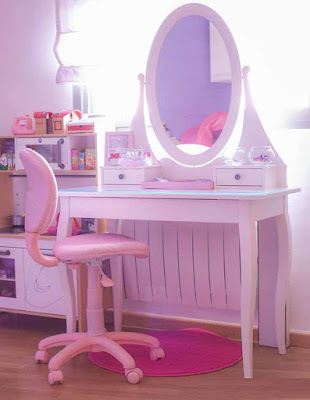 A kid's dressing table with decorative lighting. In this case, the surface of the tabletop is illuminated additionally with LED strips, spotlights or colored light bulbs. This model is better to install on the areas of the kid's room, which are poorly lit. A table with a small high chair: Such a set will always look good. Small stools or bright ottomans will suit for the little girls, and for teenagers models are equipped with chairs with soft comfortable seats or original armchairs. Plastic or chipboard. The price of products from these materials is the least. They have a wide selection of designs, but also with a short service life. When purchasing a model, you should make sure that the plastic product is made of laminated boards, the material of which must correspond to emission classes E1 or E0. 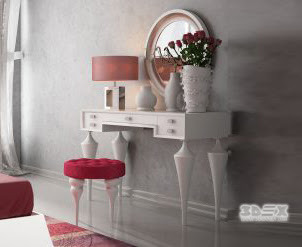 Tip: For adherents of natural materials, Girls dressing tables of MDF should be used. It has no resins, it is light enough and durable, but the cost of the products will be slightly higher than chipboard or plastic. For a teenage girl's room, you can pay attention to furniture made of wood, which is distinguished by its durability and is usually equipped with high-quality fittings. 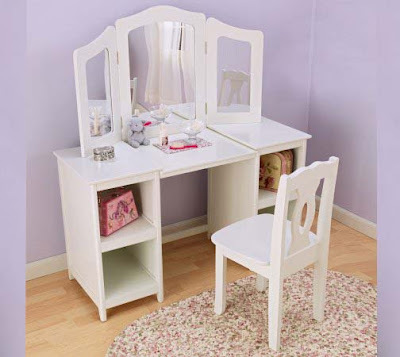 For a small room of a young princess, airy dressing tables made of transparent carbonate or acrylic are suitable. Such material is stronger than silicate glass, can be painted in any shade, available in the color spectrum, and it is easy enough to be machined, which allows manufacturers to make furniture for babies of various shapes and sizes.